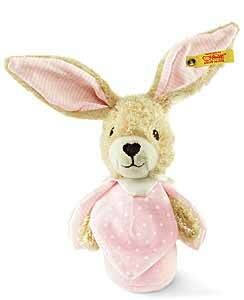 Hoppel Rabbit Grip Toy with rustling foil enclosed, is hand made, by Steiff with beautiful soft pink organic cotton for a baby's delicate skin. She also carries the famous Steiff trademark, Button in Ear along with the yellow tag. The textiles are tested for no harmful chemicals Safe for baby. All textiles in the Steiff Baby toys and gifts range are tested for no harmful substances and certified by the standard Oko-Tex Standard 100 for child safety.